9.8.2014. I bought this strand of "beads" in 1997 at the Sapto Hudoyo gallery in Yogyakarta, Indonesia. Yogya was smaller and more old-fashioned than Jakarta, which thrilled me. I had been reading The Year of Living Dangerously since we'd arrived. The story takes place in 1965 in Jakarta, before Friendship Circle was hemmed in by skyscrapers. I was disappointed that we'd missed a more colorful place. But in Yogya, the old traditions were still mainstream. You could still travel the streets by becak, a human-powered two-person vehicle (a.k.a. rickshaw). We saw a traditional shadow-puppet show -- the wayang kulit -- where good and evil battle it out amid the clanging and chanting of the gamelan orchestra. Outside the city, we visited the ancient world heritage sites of Buddhist Borobudur and Hindu Prambanan and felt like religious pilgrims. No doubt my soul was primed for enchantment when we walked into the Sapto Hudoyo gallery. I was about seven years into my bead collecting craze and making good money at my job. I was ready for something special. I saw these beads made of teeth and I couldn't pass them by. The shopkeeper didn't have the English to tell me any more than their origin (Irian Jaya) and their price (worthy of a Manhattan boutique). I bargained him down and snatched up my prize. Irian Jaya (a.k.a. 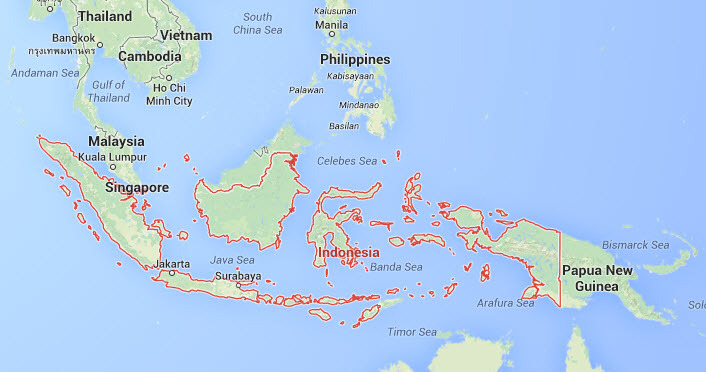 Western New Guinea or Papua) is the far eastern province of Indonesia, geographically and ethnically more Oceania than Southeast Asia. It wasn't on our itinerary, so the necklace was as close as I was going to get to something authentic from that exotic land. Back at home, I tried to research the necklace but, in those pre-Google days, didn't get far. Some of my books had photos of New Guinea jewelry and made mention of "animal teeth" but I couldn't get closer than that. The necklace joined the display on my bead wall. Fast forward to 2014. I'm reading Savage Hunter: A Tale of Cannibals, Colonialism, and Michael Rockefeller's Tragic Quest for Primitive Art by Carl Hoffman. It's research for my current writing project, which touches on the ethics of collecting cultural property, along with the magic of owning a bunch of neat stuff. Dog tooth necklaces are worn not only for personal adornment by the men of the Asmat, but as symbols of power and prestige. [The Asmat were] Known for centuries to the outside world as ferocious head hunters [and] no European penetrated the jungles and swamps of Irian Jaya until after the 2nd World War. Asmat art then became very popular with European collectors and museums. 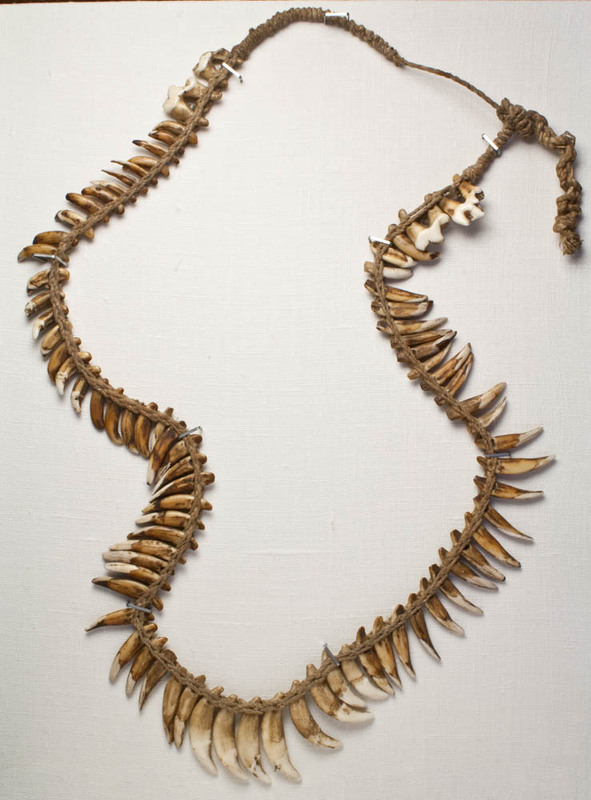 A web page from the Lowell D. Holmes Museum of Anthropology suggests that these necklaces were used as part of the rituals of vengeance, like bis poles. However a quick Twitter exchange with Carl Hoffman suggests, no: "Less for revenge; almost money, value; used in obtaining a bride; never discarded"
"Never discarded" but certainly finding its way into the stream of trade... like so many of the tribal necklaces that I've collected. I think of the dogs' tooth necklace as an heirloom piece, a "statement necklace," as the fashionistas would say. There is always a reason people give up their prized possessions. An unsentimental need for cash? Hoffman says they bring US$200 today in Asmat. Or perhaps the spreading Catholicism has made the younger generation a little embarrassed by their dead father's pagan adornments? Whichever reason, I always think of the marketplace for tribal goods as a marker of change, a signal of disruption. Something happened. And someone's treasure wound up in suburban Rochester. I'm glad this necklace is finally opening up and telling me its story.